SEOUL, South Korea — North Korea said Saturday that a senior North Korean diplomat who recently defected to South Korea is a criminal and "human scum," in its first official response to the defection. 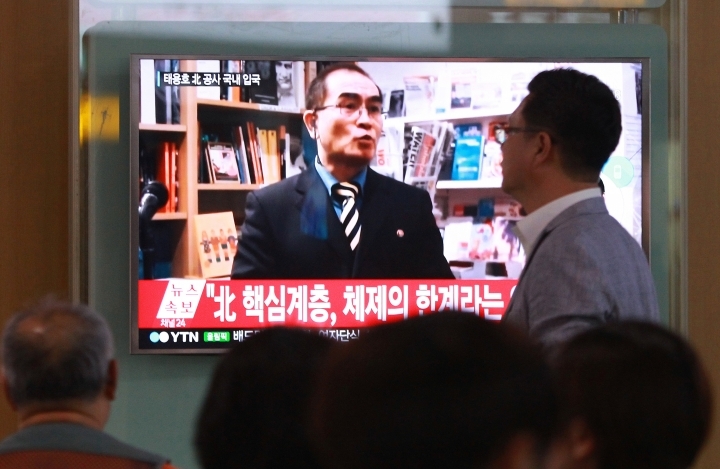 The official Korean Central News Agency also accused Seoul of using the defection of Thae Yong Ho, formerly a minister at the North Korean Embassy in London, for propaganda aimed at insulting the North Korean leadership. It also denounced the British government for ignoring international protocol by rejecting what it said were demands to have Thae extradited back to the North and instead handing him over to the South. KCNA didn't identify Thae by name, but said North Korea had ordered the "fugitive" who had worked at the embassy in Britain to return to the North in June to be investigated for a series of crimes, including embezzling government funds, leaking state secrets and sexually assaulting a minor. It said that Thae "should have received legal punishment for the crimes he committed, but he discarded the fatherland that raised him and even his own parents and brothers by fleeing, thinking nothing but just saving himself, showing himself to be human scum who lacks even an elementary level of loyalty and even tiny bits of conscience and morality that are required for human beings." In announcing the defection, Seoul's Unification Ministry said Wednesday that Thae was the second-highest North Korean official at the embassy and the most senior North Korean diplomat ever to defect to South Korea. In 1997, the North Korean ambassador to Egypt fled but resettled in the United States. The ministry said that Thae decided to defect because of his disgust with the government of North Korean leader Kim Jong Un, his yearning for South Korean democracy and worries about the future of his children. The Unification Ministry didn't immediately respond to a request for comment about North Korea's claims on Saturday. More than 29,000 North Koreans have defected to South Korea since the end of the 1950-53 Korean War, according to the South Korean government. Many defectors have said they wanted to leave North Korea's harsh political system and poverty. Pyongyang often accuses the South of deceiving or paying its citizens to defect, or claims that they have simply been kidnapped. In April, 13 North Koreans working at a North Korean-operated restaurant in China defected to South Korea. It was the largest group defection since Kim took power in late 2011. Later in April, South Korea also revealed that a colonel in North Korea's military spy agency had defected to the South last year. Most South Korean analysts say it's premature to take the defections of Thae and other senior officials as indicators that the unity of North Korea's ruling elite is starting to crack because there are no significant signs that Kim's grip on power is weakening. South Korea doesn't always make high-level defection cases public. Its announcement of Thae's defection came with ties between the rivals at one of their lowest points in decades following the North's nuclear test and long-range rocket launch earlier this year. North Korea recently has expressed anger at a U.S. plan to place an advanced missile defense system in South Korea. The North has warned of unspecified retaliation and fired several missiles into the sea earlier this month.